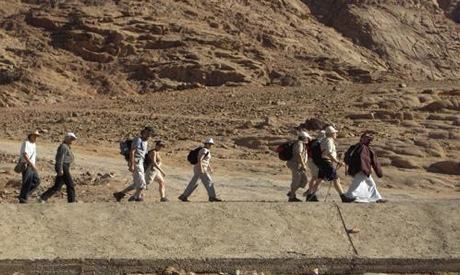 A group of Greek monks were prohibited access to the mountains near Wadi Al-Talaa valley, close to Sinai's St. Catherine, after four hikers died in adverse weather conditions in the area earlier this week. The tourism police prevented the monks' trip despite their having been registered with licensed tour guides, fearing a repeat of Sunday's incident when four hikers died in the area during a blizzard. The 54 monks had prepared a convoy of camels and hired eight Bedouin guides for the trip, but were surprised to learn of the current ban, reported Al-Ahram's Arabic website. There was a small protest by local Bedouins at the headquarters of the tourism police in St. Catherine, demanding access to the valley be restored. The deaths of the hikers hit the headlines in Egypt earlier in the week, with some commentators accusing the authorities of failing to respond quickly enough to reports that the hikers were missing. Others accused the group's Bedouin guide and the organiser of the trip of inexperience. The army, who dispatched a unit guided by Bedouins to rescue members of the hiking group who had survived the blizzard, denied the claims that its response had been slow, and published photos of the rescue operation. It was an unfortunate misunderstanding, but now it has been confirmed by the authorities: there is NO hiking ban in the Sinai mountains! it is not because people drawn in the sea that bathing should be forbidden, what do you make of that ? Welcome the few visitors who still come, don't scare them away! It was an absolutely unnecessary move from a basha of the Tourist Police. These pilgrims used to come and never had any problems, they had proper guides and permissions. Egypt and the authorities should say THANK YOU FOR COMING IN THESE DIFFICULT TIMES, instead of creating problems for visitors and the local citizens who they should help. The authorities should work with the people, for the people, not against them! !